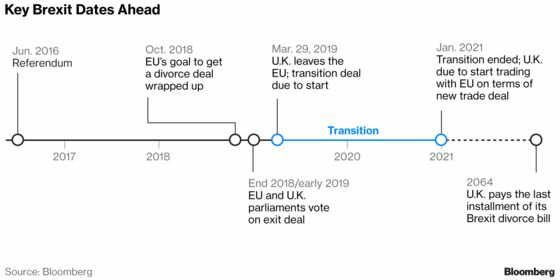 (Bloomberg) -- With less than nine months to go until Britain is set to leave the European Union, the task of untangling itself from its neighbors is proving fiendishly complex. Former World Trade Organization chief Pascal Lamy says it’s like taking an “egg out of an omelet.” Brexit, as the withdrawal is known, poses risks to people and businesses that could get caught on the wrong side of a newly erected border. The process is complicated by deep disagreement over the best approach among the British themselves. (U.K. Prime Minister Theresa May’s Brexit Secretary quit in protest at her latest proposals July 8.) With the U.K. set to exit the 28-nation bloc in March 2019, there are still more questions than answers about how Brexit will work. Here’s a guide to the trickiest issues. Brexit means the U.K. must potentially give up one of the greatest benefits of being in the EU: the ability to buy and sell stuff with the 27 other members as if they were all one country. Leaving the EU’s so-called single market and its common customs rules could cripple cross-border supply chains that have been built up over decades. Cars assembled in the U.K., for example, are on average only about 40 percent British-made, and parts can cross borders many times in the process. The EU is the destination for about half of U.K. exports. One way to keep some of those trade benefits would be to stay in a customs union with the EU. That means the U.K. would adopt the same set of tariffs as the EU for outside countries and avoid new customs checks. But it would also prevent the U.K. from striking its own trade agreements with the likes of China, India and the U.S., a freedom that’s critical for many pro-Brexit campaigners. May proposed a new approach in July, whereby the U.K. would collect tariffs on behalf of the EU and refunds are issued if U.K. tariffs are different. Opponents of a customs agreement say Britain should have a clean break from the bloc and be liberated to pursue new trade deals with other countries, as well as to make its own laws, free from European influence. In any case, the timeline for the Brexit talks means that negotiations on the details for future U.K.-EU trade won’t take place until after exit day. So importers and exporters will probably be allowed to operate under the old rules until at least 2020. After Brexit, the U.K.’s new land border with the bloc will run through the island of Ireland. At the moment the divider is an invisible line between the Republic of Ireland (which will remain part of the EU) and Northern Ireland (a region that’s part of the U.K.). Both sides have pledged not to let a policed frontier emerge, fearful that any physical signs of a border – even cameras operating on some sort of seamless, technologically-controlled boundary – could reignite sectarian violence or renew questions about a united Ireland. There’s no obvious solution. To ensure that they’ll be able to keep serving EU customers, firms in Britain’s financial industry, known collectively as the City, have been setting up subsidiaries elsewhere in the region and moving employees to cities including Frankfurt, Paris and Dublin. They aren’t taking any chances, since they don’t know what kind of access they’ll get after the split. Britain wanted a system based on “mutual recognition” of rules that would enable London-based staff to continue to sell stocks, bonds and other financial products to customers across the bloc. The EU instead proposed a system based on so-called equivalence, in which the bloc would grant selective access to certain lines of business on a case-by-case basis. Even that would be revocable. The two sides agreed in December 2017 on a deal that would protect the rights of more than 3 million EU citizens now living in the U.K., and about a million British citizens residing in the bloc. It basically allows them to stay where they are and continue to enjoy pensions and access to health care where they live. But the agreement is subject to a final divorce deal being reached, so affected citizens are still in a state of limbo. What immigration policy will look like in the future is still up for negotiation, although the U.K. has said repeatedly that it will halt the policy of “free movement” that allowed an unlimited number of EU citizens to settle in Britain. Polls don’t offer much evidence that Britons have changed their mind. But there are plenty of campaigners trying to reverse Brexit. Their big opportunity will be when the negotiated divorce deal comes to the U.K. Parliament for approval, which is expected to happen in the fall. Anti-Brexit lawmakers might try to muster a majority to reject the deal or force the government to put it to a second referendum. Failing that, they may try to adjust the terms or send negotiators back to the table for another go. A QuickTake on why the British voted to leave the EU, and Q&As on the Irish border, the customs union and London’s fight to remain a financial hub. Opinion pieces from Therese Raphael on why Brexit is turning into the "Road Trip From Hell" and why the U.K. can’t decide what Brexit will mean. Robert Hutton explained Theresa May’s strategy of procrastination. An interactive map on the areas of the U.K. most vulnerable to Brexit.